The crazy thing about the Thick-legged Eastern Tarantulas is that they look very similar from Rockhampton to the tip of Queensland, but we know the venoms are quite different and initial studies show the spiders from widely separated places won’t mate. So they are a real challenge. The purpose of our trip was to better understand the variations and diversity of these spiders across the geographic range from Rockhampton to the tip of Cape York. In addition, I am interested in the other exciting spiders of the Cape that show the effect of the New Guinea fauna, some of which even “invades” the Cape in summer. 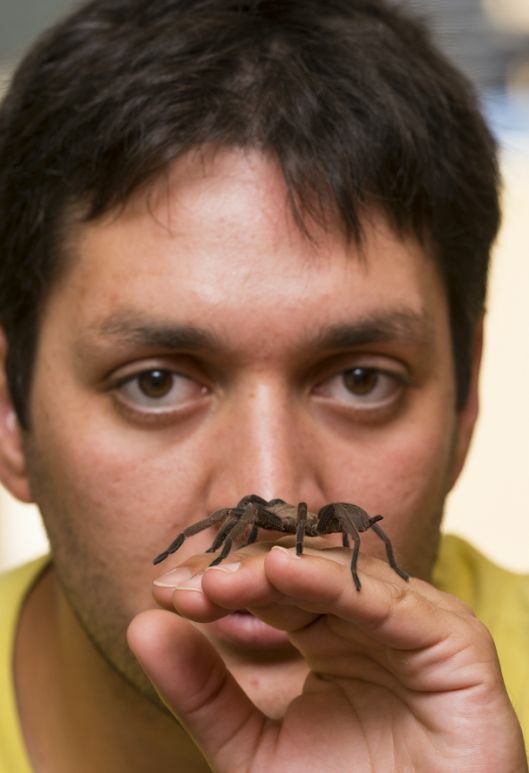 My colleague Renan Castro Santana, pictured with a placid Phlogius crassipes, Thick-legged Eastern Tarantula. Renan is from Brazil and preparing to do a PhD at the University of Newcastle and handles these spiders with a great deal of care. Handling tarantulas is a delicate operation; dropping them can cause their stomachs to rupture and kill them. At least three genera are found on the Cape and they include at least five species, four of which are new and we are working on naming these now. We have limited material of these specimens and certainly no live images and no material suitable for molecular work, a critical aspect of resolving this complex situation. Cape York is one of the most challenging places to get to in Queensland. In the summer months (October—April), the roads are often flooded and impassable, if you can manage the heat. In addition, what few areas are dry are often owned by large crocodiles. So we were restricted to the dry period (June—September), when tens of thousands of corrugations mercilessly rattle flesh, bone and machine as we plough through mile on mile of eternally floating bulldust. Fortunately, we made it there and back and with a great deal of success in our endeavours. We returned with 60 live tarantulas, setting a new record for the team as we’ve only brought back a maximum of 10 of these spiders in past expeditions. Some were found in burrows over 1 metre deep, where they hide themselves for protection from predators and the heat. The team and I will now study these Queensland tarantulas to develop a better understanding of them and the impact the geologically ancient connection to New Guinea biota may have had on them.